Image: "Nice light! But I can't identify the boat. 2011 worlds, Travemunde, Germany. Photo: © Robert Muller"
Image: "Dave Timson (GBR339) at the 2017 Worlds, Pwlhelli. Photo: © Robert Muller"
Image: "Uphill Challenge: Peter Ullmann (GER79) leads a bunch of others at the 2011 worlds, Travemunde, Germany. Photo: © Robert Muller"
After 19 years the New York Canoe Club Challenge Cupis on its way back to the United States. By winning the first two races of the series held at Aldeburgh on August 11th-13th Louis Whitman, the American challenger easily defeated the Brtish defender Peter Griffith. Owing to the weather conditions it was decided to hold the races on the River Alde. 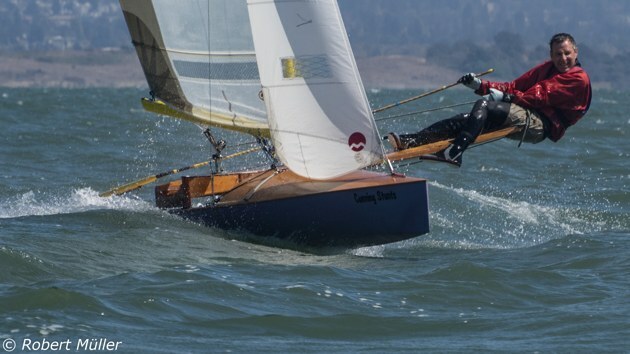 The American canoe "Manana" soon showed her superiority to windward and in a 12-15 knot south westerly breeze drew away from "Eastwind" the new British canoe designed by Austin Farrar and built by the Woolverstone Shipyard. At the windward mark, Whitman was almost a minute ahead, but off the wind "Eastwind" seemed to be faster and by the end of the first round was within ten seconds of the American. However in an increasing wind "Manana" again drew ahead on the beat and eventually finished the ten mile race 2min 42sec ahead. Peter Griffith got a good start in the second race, crossing the start line 25 seconds ahead of Whitman, but again "Manana" hauled up on the bear. At the weather mark, the two boats were almost level when "Eastwind" capsized. It was nearly 2 minutes before Griffith could get going again and by this time Manana was uncatchable. She sailed round easily to win by just under 2 minutes. Lou Whitman was sailing the sane canoe which he brought over in 1948. he designed and built her himself, and although minimum beam (38in) she has powerful sections and is pretty stable. She has an outboard [=stern hung: Editor] rudder controlled through a simple limnkage to an athwartships tiller which also acts as a handrail for the helmsman as he uses his slide. 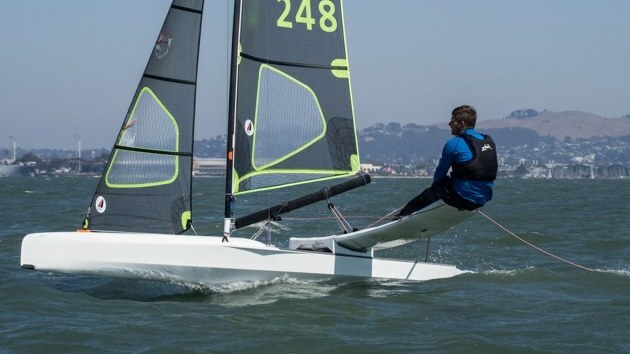 Whitman has now given up nylon sails for conventional cotton because the nylon stretches too much, He has also abandoned his loose footed mainsail. However, he has still got his 5ft slide which he certainly knows how to use and the clean and smooth way he goes about is a joy to watch. Surprisingly enough the only new gadgets to be seen were on "Eastwind". She was fitted with a curved, hollow, box-section sliding seat. It is light and the idea of the curve is to help the helmsman to keep the boat upright and yet be well clear of the waves. However, as the races were held on smooth water, this did not help very much. The other innovation was an automatic [self-tacking: Ed] jib. The sail is set on a boom which is fixed to, and protrudes beyond, the forestay. The boom is held down by an "uphaul" from the forward end (a sort of treverse kicking strap) and the flow of the sail is altered by adjusting the tension in the uphaul wire. When tacking, the operation of the boom is entirely automatic anbd is controlled by a normal endless foresheet through jamming cleats. To eyes accustomed to modern rigs, the projecting spit gives an old-world appearance. But despite its looks, it seems that it might be a device with great possibilities. ...Although now built to a common rule, the American and English canoes were quite different in hull shape as well as sporting different rigs. The American boats were truly 'double ended'; their stems were as fine as their bows (in some cases identical) and remained as displacement boats, albeit very fine and easily driven. They were so unstable that, when not sailing, they would fall over! The English boats had broader, flatter sterns, out to the limit of 90 degrees in plan view, and would plane at well beyond their displacement speed in a strong breeze. In 1952 there came the first post war challenge [editor's note: the records show a previous post war challenge in 1948] for the International Canoe Trophy from Lou Whitman of the USA; and the Royal Canoe Club had two new canoes built to select a defender. Jack Holt designed and built 'Conquest', a plywood Sharpie; while I, with some practice in building cold moulded plywood international Fourteens, produced 'Eastwind'; a little more vee-ed than 'Wake' (with which l was by now quite familiar) and a little finer forward, but not so extreme as 'Flying Fish', which was very fast but also very difficult to sail. Their sail plans were identical, and each boat had her own soft mainsail, while they shared a fully battened one at first, and later had one each. Selection trials were held in Chichester Harbour with Peter Griffiths sailing 'Conquest' and Graham Goodson in 'Eastwind'. Sometimes the whole fleet joined in to allow comparison with existing boats; sometimes the two new canoes simply match raced each other. Graham Goodson was tall: had very long legs, and sailed with mainsheet and tiller extension in hand, his feet on the gunwale, but not using the full length of the slide. Lou Whitman's canoe, although beamier than the early American designs, was relatively narrow aft with the rudder hung on the sternpost, linked to a T-shaped yoke post close abaft the sliding seat, and through which the pole tiller slid transversely, the end moving fore-and-aft to steer the boat. Lou, who had relatively short legs and a compact body, would cleat main and jib sheets and retire to the end of the sliding seat where he curled up and sailed the boat with only the tiller for control. 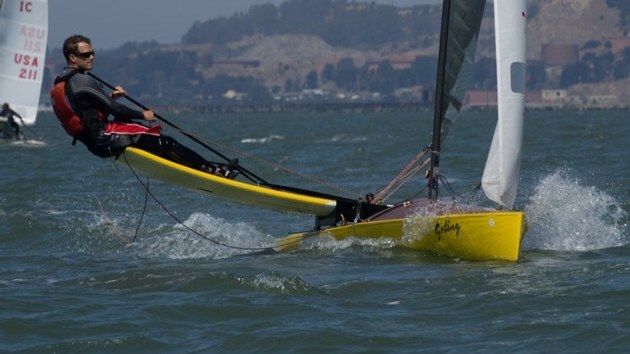 Tacking took time and if he found himself overpowered his only recourse was to capsize and start again. The challenge racing was to be held at Aldeburgh, Graham's home waters, either on the river Alde at Slaughden, or at sea (just the other side of the shingle bank) if the weather was good enough. Graham reckoned that if he could lure Lou Whitman into a tacking match, with his superior tacking speed he was bound to win. But to make sure, on my suggestion, we equipped 'Eastwind' with a self-tacking jib (just like that fitted to a model yacht) so that the boat could be thrown about even quicker; and this worked very well in practice. Unfortunately, a few days before the racing was due to start, Graham Goodson went down with pleurisy, and although he was soon on his feet again, was unable to go afloat. Peter Griffiths found himself defending helmsman, with no experience of sailing 'Eastwind', and very little of the river Alde, or of match racing tactics. 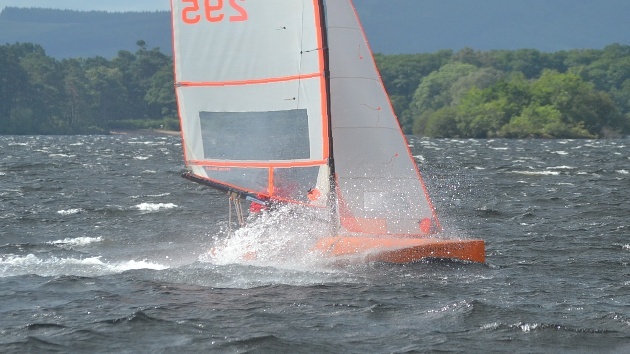 After a trial in the North Sea, a bad weather forecast meant the racing had to be on the river, and early in the morning before the wind got up for the day Peter Griffiths opted for the soft mainsail. Lou Whitman managed to get the better start twice, and pulled away to win the international Challenge Trophy in two straight races. 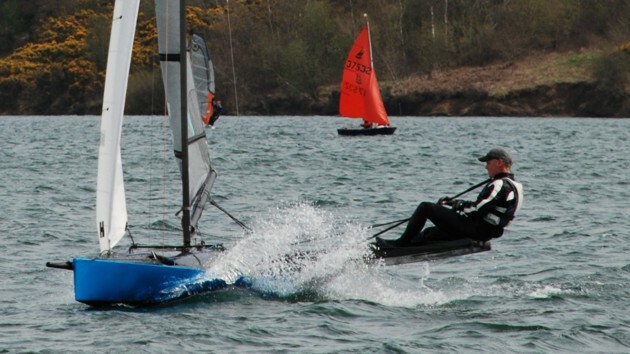 Image: "Alistair Warren (GBR317) at the 2017 Worlds, Pwlhelli. 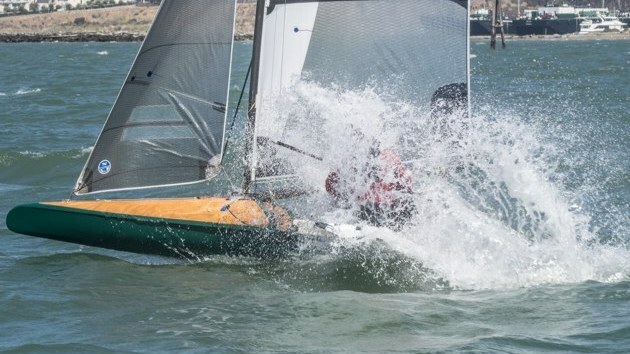 Photo: © Robert Muller"
Image: "Steve Fleming (GBR158) at the 2017 Worlds, Pwlhelli. Photo: © Robert Muller"
Image: "Chris Hampe (GBR308) at the 2011 worlds, Travemunde, Germany. Photo: © Robert Muller"
Image: "Robin Wood (GBR329) at the 2017 Worlds, Pwlhelli. Photo: © Robert Muller"